In 1947 six flying saucers circled above a harbor boat in Puget Sound near Tacoma, Washington, one wobbling and spewing slag. The falling junk killed a dog and burned a boy’s arm. His father, Harold Dahl, witnessed it all and brought his partner, Fred Crisman, down the next day to see yet another UFO. The Maury Island incident became the first UFO event of the modern era. In 1968, New Orleans district attorney Jim Garrison subpoenaed Fred Crisman as part of his investigation into the JFK assassination, which became the subject of Oliver Stone’s 1992 JFK movie. Garrison believed that Crisman was the infamous grassy knoll shooter. And he’s the central figure in the “Mystery Tramp” photo of the Dallas rail yard hobos. Illustrated with rare newspaper images, JFK & UFO interconnects the lingering mysteries of America’s most notorious assassination and its weird ufological subculture. It examines the denizens of the bizarre, semi-spook underground reflecting a stranger and more true history than offered by the mainstream. What Kenneth Arnold came to believe about UFOs. Close-up on Guy Banister, an FBI agent inked to both Maury Island and JFK. Oswald worked for him as part of his “Fair Play For Cuba” cover. Fred Crisman: right wing radio talk show host before his time, with material from heretofore unseen newsletter from The Institute for American Democracy. Gerald Heard and the missing Maury Island chapter. 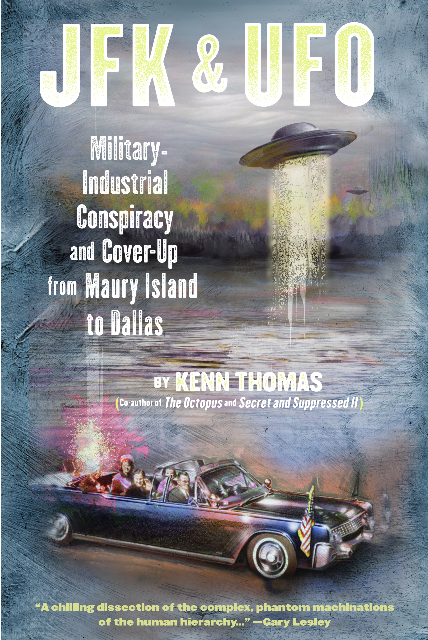 Kenn Thomas works as a conspiracy investigator, university library archivist, and editor and publisher of the conspiracy magazine, Steamshovel Press. For Feral House he has written The Octopus: Secret Government and the Death of Danny Casolaro, which helped expose the Inslaw scandal of the Reagan years. Thomas also co-edited (with Adam Parfrey) Secret and Suppressed II: Banned Ideas and Hidden History into the 21st Century. Download the Table of Contents, Foreword to the New Edition, and Introduction Here.